Prices is the annual winner of this award (is there enough room on the wall for all the certificates?) and has also been cited as a great spot for cardiologists to scout for patients. The chicken dinners (seafood and barbecue, too) are packaged in cardboard boxes that are almost as famous as their contents. 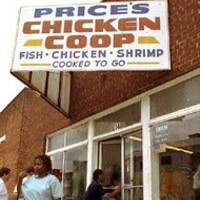 Prices chicken is the fried chicken that made the South famous.